The Pinto Cruising Wagon in its original form was definitely a product of 1970s North America, with the porthole windows and pinstriping showing that even the Big 3 were hip to the latest craze… well, maybe a few years after it started, with their hands forced by the fact that the only way to make a late 1970s car exciting was adding stickers and stripes. Since a previous owner painted over the stripes, consider this a blank canvas for vanning cliches like unicorns, panthers, and vixens with quivering bosoms. 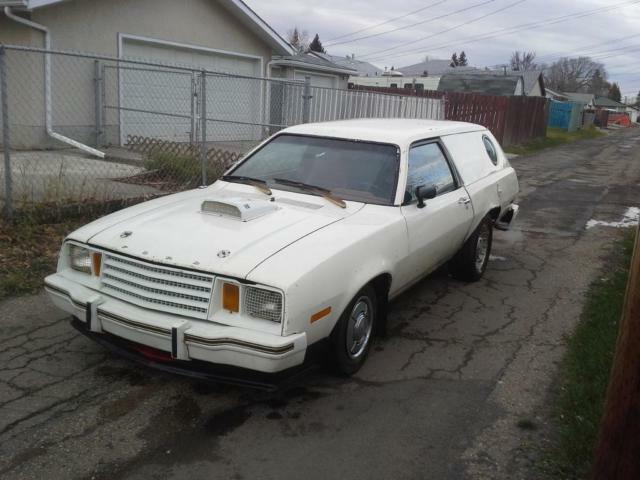 Speaking of modification, the seller has owned the car since 1990 and added a 302 V8 back in 2001. For some reason, the 302 is only good for a top speed of 97mph, but that’s maybe limited by the rear end, since the car will do the quarter mile in just over 11 seconds. At this point, the rear wheel wells are said to need repair, and though it’s been parked for 12 years, it’s said to start up and drive onto a trailer. Right now, the car wears Fox Mustang turbine wheels on the rear, and Pinto wheels and caps on the front – matching wheels all around for either a muscle or stealth look would be better. 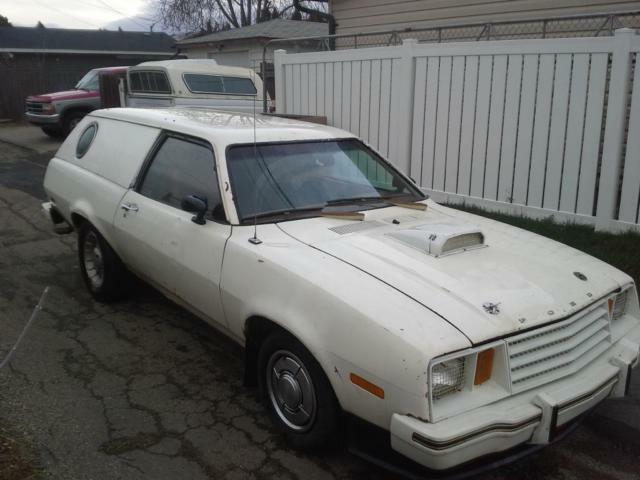 The white-out paint job is very 1980s, and the scoop and hood pins are probably overkill. Has anyone upgraded one of these in a period road-racing way? How about Minilites and a paint job in the style of the Car & Driver IMSA Pinto? This entry was posted on November 3, 2015 at 1:54 pm and is filed under Feature. You can follow any responses to this entry through the RSS 2.0 feed. You can leave a response, or trackback from your own site.